The benefit of a breakfast sandwich is that it tends to pack a decent protein punch without breaking the bank. And if you find the right one it doesn't have to destroy any shall we say, "healthier eating intentions." At 240 calories it's one of the better for you items on the menu by far. It packs 13 grams of protein and 7 grams of fiber for $3.52 including tax. The wrap itself is pretty tasty. 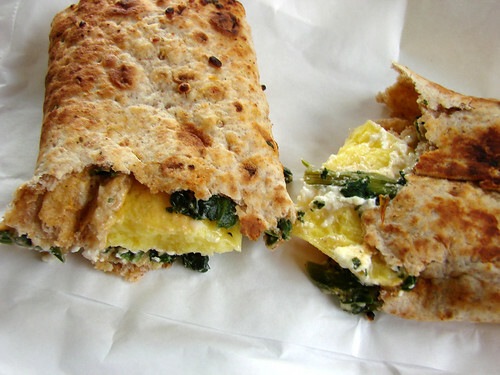 The actual wrap has a pleasant texture and flavorwise the spinachy feta goodness dominates. I'm not going to lie, the "egg insert" kind of creeps me out. The texturewise it's akin to some kind of egg flavored spongy packing material. But if just eat the wrap and don't obsess about the texture, it's actually pretty darn good and strangely compelling. 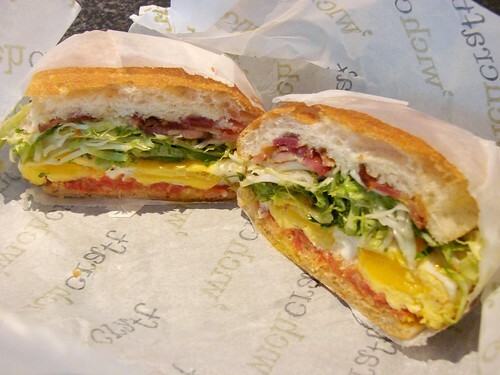 The breakfast sandwiches are available all day at the 'Bux. I'm always on the hunt for a good cheap lunch in midtown and at around $3.50, the spinach feta wrap satisfies without making me feel too guilty about the money I'm spending or what I'm consuming. 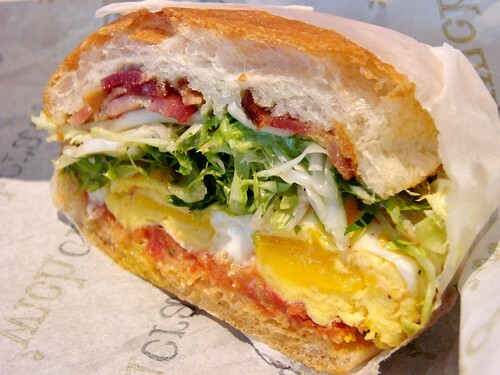 Last week I tried the fried egg, bacon, gorgonzola & frisée sandwich on ciabatta roll from 'wichcraft. As a breakfast sandwich it's pretty intensely satisfying. The fried eggs were a bit overdone for me. I was hoping that the egg would have a softer yolk like their marinated white anchovy sandwich. Since wichcraft has less than 15 locations throughout the US (by my count they have 13 locations), they aren't mandated to post calorie counts so I have no idea where this weighs in though I'm willing to be it is higher in calories and fat and lower in fiber. Still, if one of the complaints about 'wichcraft is the price to serving size ratio, most sandwiches at 'wichcraft run from $5.95 for a grilled cheese to $9.75 for a chicken breast sandwich, at $6.95 this sandwich is t the lower end of the 'wichcraft price spectrum and like Starbucks breakfast is available all day long. Do you ever eat breakfast for lunch or dinner to save cash? Where do you like to go? sometimes I've yogurt with museli for lunch or dinner. Easy way out - protein with carb all in one. I used to get the starbucks spinach feta wrap all the time. It is quite yummy but one day the "egg insert" got to me more than usual and haven't been able to go back to it since lol. the fried egg sandwich at wichcraft is one of my favs. though i do like to order from cer-te at lyns catering in midtown - very good too. These recipes are great! Just in case you're looking for some other simple, healthy & organic breakfast options to grab on the run in the morning, consider Van's Organic Frozen Waffles. Made from all natural ingredients, these waffles are free of dairy, eggs, trans fat and preservatives. They also have wheat free varieties, mini sized waffles rich in calcium for kids, or a great 97% fat free option. Or, keep in mind Eggology's new organic Hardboiled Eggs or their On-the-Go Egg Whites - organic scrambled egg whites ready in 95 seconds in the microwave.